For some Brexit supporters a US trade deal is the greatest prize, proof that leaving the EU has made a real difference. A US-UK deal could also make a big difference to arrangements at Northern Ireland's borders. It could potentially see the land border hardening or the introduction of new checks at Irish Sea ports. The reason is food, particularly chicken and beef. EU rules currently limit US exports of certain food products, citing concerns about production and environmental standards. Chlorine-washed chicken has become the totemic product. 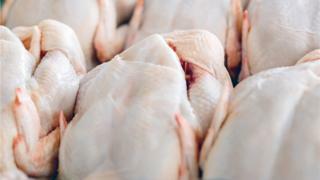 Chemical washing is used in the US to kill bacteria on raw chicken, but it is banned in the EU. The US opening position is that in a trade deal it would expect the UK to accept these controversial products. That was expressed in slightly technical language last week in a document, published by the US Trade Representative, which called for the elimination of "unwarranted barriers." The US ambassador to the UK, Woody Johnson, followed up with a newspaper article which spelt out clearly what that means. Image caption The US ambassador to the UK, Woody Johnson said US food had been subjected to "a smear campaign"
He said US food had been subjected to "a smear campaign from people with their own protectionist agenda". Mr Johnson warned of a "missed opportunity" if the UK continues to follow "the EU's traditionalist approach to agriculture." If the UK decided that it would accept these food products the EU would want to be sure they do not enter its market. That poses a particular challenge in making sure such products don't enter the EU across the Irish border. The EU enforces standards on food imports through border inspection posts, which are typically located "in the immediate vicinity of the point of entry" into the market. Sir Martin Donnelly, the former permanent secretary of the Department for International Trade, said: "It is just not plausible to see how you could run two different agricultural systems and still keep that open border we're committed to." If chlorine chicken is not to be turned back at the Irish border, could it be policed at the Irish Sea ports? Shanker Singham, director of international trade at the Institute of Economic Affairs, suggested that a common food standards zone covering the island of Ireland could be a way round the problem. Currently the island is a common animal health zone, meaning livestock entering Northern Ireland from elsewhere in the UK is subject to checks and controls. Speaking on Newsnight, Mr Singham suggested the scope of this arrangement could be extended to form what is known in the jargon as a common "sanitary and phytosanitary" (SPS) area. "You don't have a common SPS area right now on the island of Ireland, you might need something like that. It would make life a lot easier." He added that, in his view, just an arrangement "would not be a problem" for the US and other big trading partners. However, it may be a problem for unionist politicians in Northern Ireland. An all-island food standards zone would mean Northern Ireland following different rules from the rest of the UK. That would also mean some new checks and controls on food products coming into Northern Ireland from the rest of the UK. In effect it would mean that a major part of the backstop, which is firmly opposed by unionists, would become a permanent arrangement.